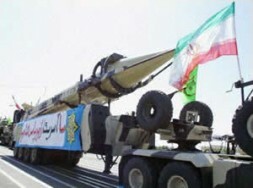 A Shahab-3 missile on display during a military parade in Tehran. A Mullah A-Bomb can only be avoided by threat of power and effective verification. President Bush is completely right in saying that Iran will only refrain from developing its own "Mullah" nuclear arms if Western powers force it to. Totalitarian regimes such as Iran's where political opponents are scrupulously tortured and killed cannot be easily persuaded by lukewarm words. As stated by Fritz Kraemer in the book On Excellence: "If you look at it objectively, plain violence and raw power are necessary to check wild, untamed fanatics. There can be no diplomacy without the threat of power behind it. Nothing works without power". Through their use of "soft diplomacy" toward Iran, Chirac and Schröder seem to be unaware that "provocative weakness" (Fritz Kraemer) may open the door for Tehran's nuclear arms - something both leaders are trying to prevent. The decisive question is not one of "diplomacy or military threat" but rather whether or not there should be effective diplomacy or ineffective diplomacy à la Munich Conference. Should and do Schröder and Chirac want to act like Chamberlain and Daladier, who pushed open the door to the Second World War through "provocative weakness" in 1938? US Deputy Secretary of Defense Paul Wolfowitz rightly pointed out at the presentation of my book Fritz Kraemer On excellence that someone must stand up against evil powers. Read it for yourself! 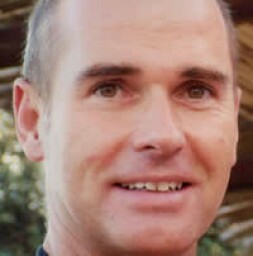 In the following article "Proliferation of WMD and Terrorism", Professor Michael Stürmer writes: "While the US pronounces the possibility and legitimacy of pre-emption, the Europeans could not translate theory into practice". The "threat of power" and military option must remain. Military intervention is the ultima ratio regis, the very last option. The totalitarian Mullah regime must be weakened at the core and the forces of freedom must be supported. Iran is only a threat because it is ruled by an unscrupulous power that suppresses the majority of the population as was done in the Third Reich. The West needs a distinct policy for the democratization of Iran with solid financial backing. The top priorities now are diplomacy and a unified Western position of engaging in negotiations that clearly demand that Iran stop all of its uranium enrichment programs and that there be definite verification that enrichment has been halted. Taking a soft position and cameras that can be subjected to manipulation are a joke. On-site inspections, including the inspection of secret installations, are essential. I would like to thank the star-journalist Seymour Hersh, who revealed in the New Yorker that the US is conducting on-site reconnaissance. What is wrong with this? It is better to know the truth about whether or not Iran is building nuclear arms. Read his article below !